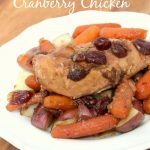 Slow Cooker Cranberry Chicken – Only 5 Ingredients! When I started blogging 3 years ago, my goal was to share easy and inexpensive craft projects. Along the way I’ve shared my favorite recipes and I want to start sharing more recipes. I’m not a fancy cook at all. Ask any of my friends and neighbors and they will tell you that I would probably starve if it wasn’t for them feeding me on a regular basis. I’m lucky to be surrounded by lots of people who love to cook. My sweet neighbors Dion and Charles always bring us leftovers or invite us over for dinner. When I do cook, the meals usually consist of salad with chicken, tacos, or spaghetti. We also have breakfast for dinner at least once a week. So, my new goal is to make more meals at home and I’m going to try and keep them simple and healthy. Today’s meal, Slow Cooker Cranberry Chicken, is a family favorite. My mom makes it all the time with beef brisket but I decided to try it with chicken since it is less expensive. It’s so easy and only requires 5 ingredients. 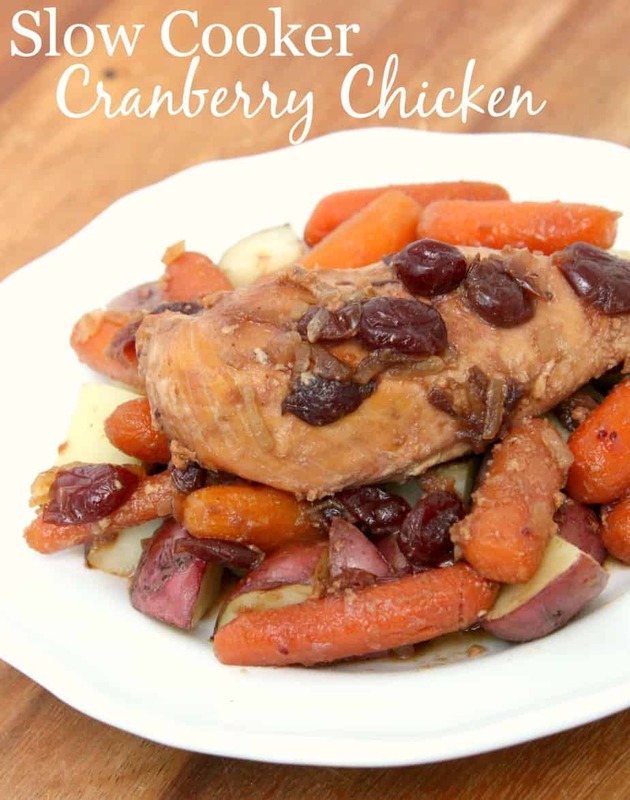 Slow Cooker Cranberry Chicken – An easy and delicious recipe made in your slow cooker. Pour cranberry sauce and onion soup mix over chicken. So delicious! This is the perfect meal for a busy work night or if you are having people over for dinner. Everyone will love it. I’m going to give this a try but due to my husband’s dietary restrictions, I’ll have to use the jellied sauce. I’d think you’d get the same flavor. I’ve made something similar to this before and its great! Pinning this one to try soon! Yummy! Going to have to try this one! Mmm! I love anything you can make in the crockpot; quick and easy is my jam! Great recipe. nothing beats a yummy meal ready in the crockpot! Ooh! I love easy slow cooker meals Kara! This looks fantastic! I love easy and I love the crockpot! Thanks for the recipe!